"What also works is an extensive use of music. 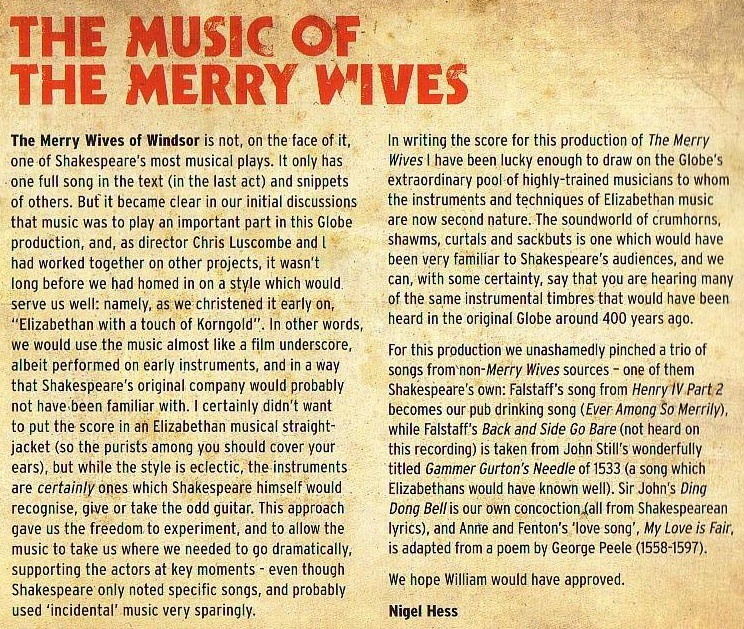 Not only is there a delightful duet for the two young lovers and a merry drinking song as well as the fairy roundelays of the final scene, but music leads entrances and supports dialogues and speeches; composer Nigel Hess makes a major contribution to the production's style and atmosphere." "Nigel Hess’s merry, delicate musical score....I was touched by the young lovers, Anne and Fenton, singing a roundelay in the pretty garden." "As with many of the Globe's productions, music plays an important part in this show. Shawms, lutes, curtals, citterns and other strange-sounding musical instruments are employed to provide the accompaniment which assumes something of the role of a film soundtrack. There's also a delightful and charming duet between Anne Page and one of her suitors, Fenton." "The small band playing venerable instruments gives an enthusiastic account of Nigel Hess’s whimsical music."